In the past couples months, Viet Pham’s new Pretty Bird eatery has been garnering most of the foodie press in town, and deservedly so. 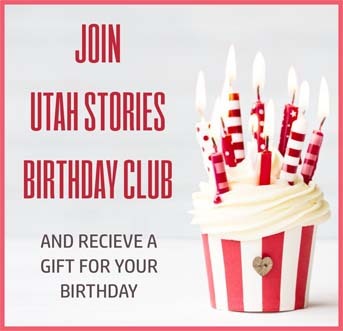 However, there’s another excellent dining spot on Regent Street in downtown SLC – the one that owner/chef Michael Richey opened in winter of 2017, called Fireside on Regent. This downtown bistro specializes in Central Italian-style wood-fired pizzas, homemade pasta dishes, fresh and innovative salads, and an eclectic selection of small plates listed on the menu under the “Urban Picnic” category. 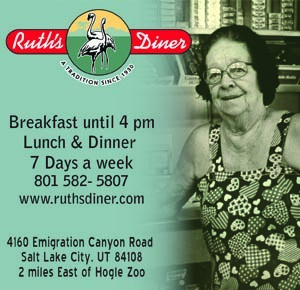 Whether you visit for a snack – say, prior to an event at the adjacent Eccles Theater – or sit down for a full meal, you’ll not be disappointed. The service and ambiance at Fireside on Regent stand shoulder-to-shoulder with the top-notch cuisine that Richey’s kitchen produces daily. 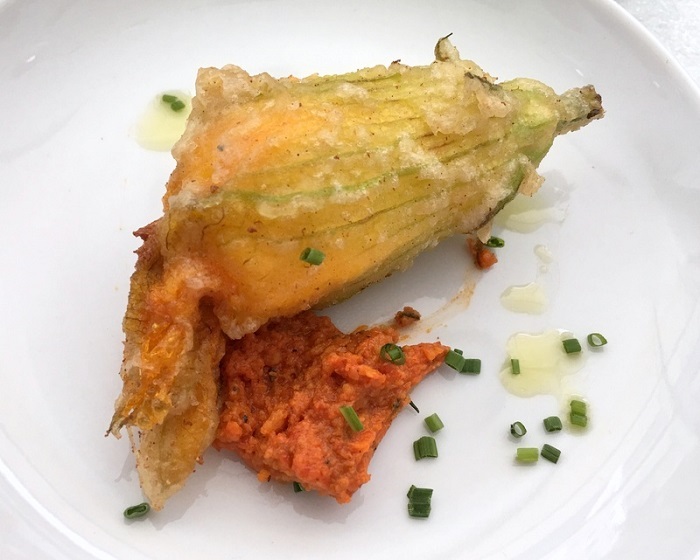 Whether you choose to sit at one of the restaurant’s tables or at the counter with views of the kitchen action, I can highly recommend ordering the fried squash blossoms ($9) stuffed with house ricotta. The blossoms are ever so lightly fried and drizzled with Meyer lemon dressing. Or, since avocado toast is the “in” thing this year with foodies, you could also try Richey’s spin on it: Hass avocado bruschetta ($9) with Villa Manodori balsamic vinegar and Maldon salt. I have yet to try a pasta dish at Fireside that failed to be stupendous. Chef Richey has a way with fresh pasta, helped along by his nifty pasta extruder. So you’ll be in great shape whether you choose his gold potato gnocchi ($16) with langoustines and brown butter; the herbed ricotta ravioli with roasted chicken thighs, homemade ricotta, onion butter, shallots and Meyer lemon ($15); or mac & cheese ($14) made with smoked Gouda, Beehive Cheddar, sweet peppers, pancetta and breadcrumbs. Still, the pasta dish I love the most is Richey’s bucatini ($21). 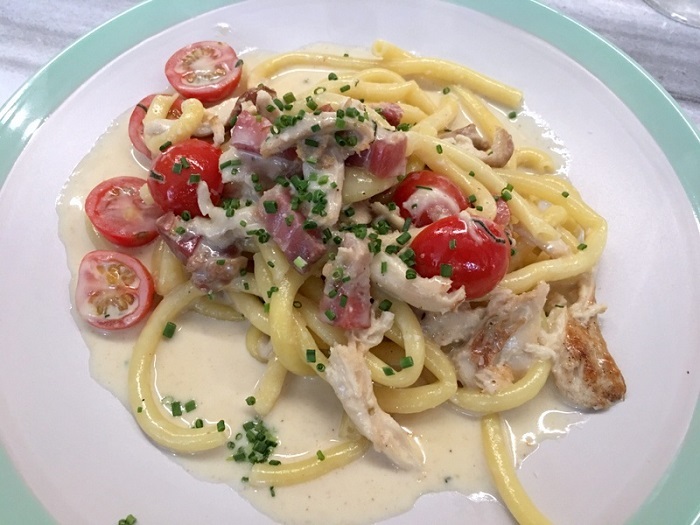 In this dish, hearty bucatini pasta is tossed with white wine-braised rabbit shreds in a sauce of leeks, garlic cream, sage, cherry tomatoes and snipped chives. I’ll be bummed if this perfect pasta dish ever leaves the Fireside menu. But maybe I’ve saved the best for last… I mentioned that Fireside on Regent specializes in wood-fired pizzas. And boy, do they ever! 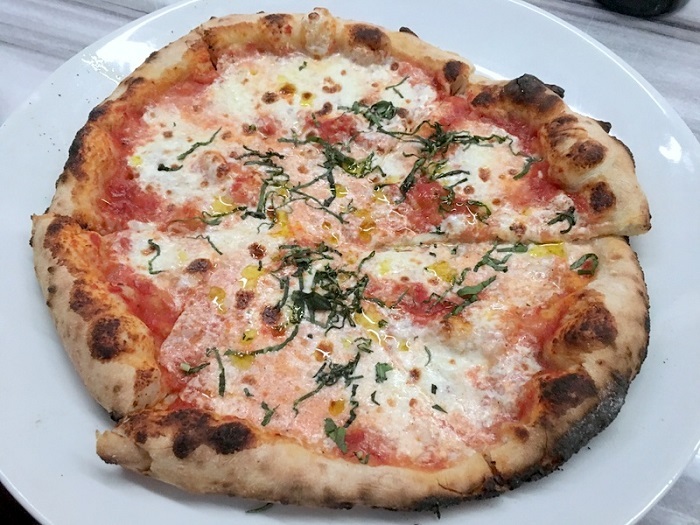 The Neapolitan-style pizzas here are as tasty as I’ve had anywhere – truly upper crust. Cooked in the restaurant’s pricey Valoriani oven, the most basic pizza – essentially a Margherita – is called the Milk Run ($16). It’s a simple pie with a perfect crust topped with milled tomatoes, house-pulled mozzarella, fresh basil and drizzled with olive oil. This is a perfect example of the “less is more” principle at work, with each simple, but high-quality ingredient coming together to create a perfect union. There’s a “Classic” ($17) pepperoni pizza that’s far better than any other you’ve ever had, as well as an unorthodox pie called the Tuscarora ($18). That one incorporates fingerling potatoes, sunchoke cream, ricotta, house-pulled mozzarella, pancetta and sunchoke chips into the pizza. Another cutting edge pizza is the Patsy Marley ($23) with Littleneck clams, chorizo, roasted sweet peppers, mozzarella, milled tomato and saffron aioli. Fireside on Regent is open for lunch and dinner most days, and the restaurant opens for lunch at 11 AM on Saturdays or Sundays when there is a matinee at the Eccles Theater.